Hey Zack, great one! Would you mind posting the schematics you used as well? Great find! The rotary just adds between 1.5 and 60k between pin 6 and ground, right? Then it could be replaced with e.g. 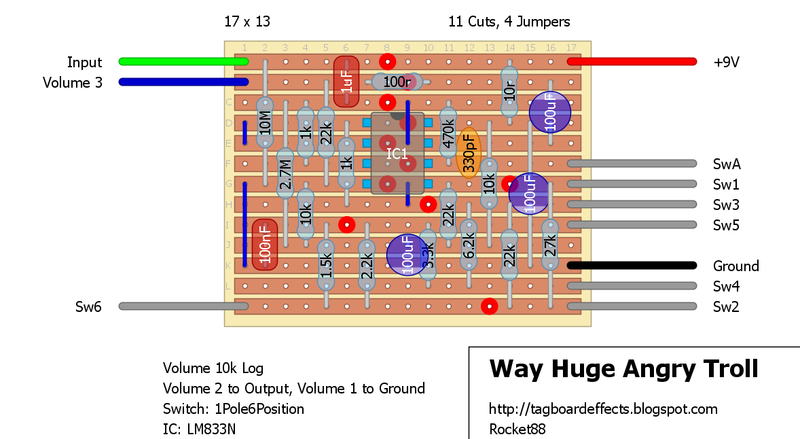 a 100k pot wired as variable resitor (maybe with 160k in parallel to make it approx. 60k) as a simple mod - am I thinking correctly? Cheers! took care of it for you. 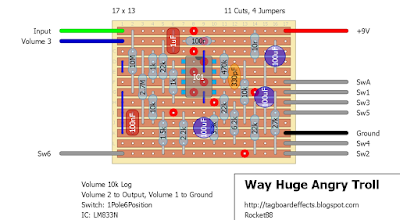 Schematics do not get posted on this site but as it says in the description FSB will have it so head over there mate. here only 3 not electrolitic cap on board. it's 330pf, 100nf and... it has mark "1.0J63" on it so i think that its 1uf. So it must be 330pf (monolithic ceramic) and 100nf (marked as 104) red film cap. Awesome thanks man. I'll make the change to the board. Call this verified! I used a 47p instead of the 330p as i have only just noticed the change as i was building. Still sounds pretty awesome with a 47p. Will remove and socket to see what it changes. Thanks for the layout Zach! awesome. can't wait to hear the sound comparison when the caps are switched. always had a soft spot for this one when it came out. The pot version is in error. The 100n cap connects to ground, but the other lead is floating. Plus the gain pot's lug 1 cannot be connected to ground. Refer to OD250/Dist+ to see hot to wire the gain pot. Only two terminals are used. Looks better. However, there should be 1K5 resistor between gain pot and 100n cap to get the pot settings per original. Also, the C-taper is a must with this gain control method. I was thinking antilog would be best too, but wasn't sure. With changing the switch to a pot I think with it as is you'll get more distortion with the pot due to being able to get lower resistance then 1.5k. 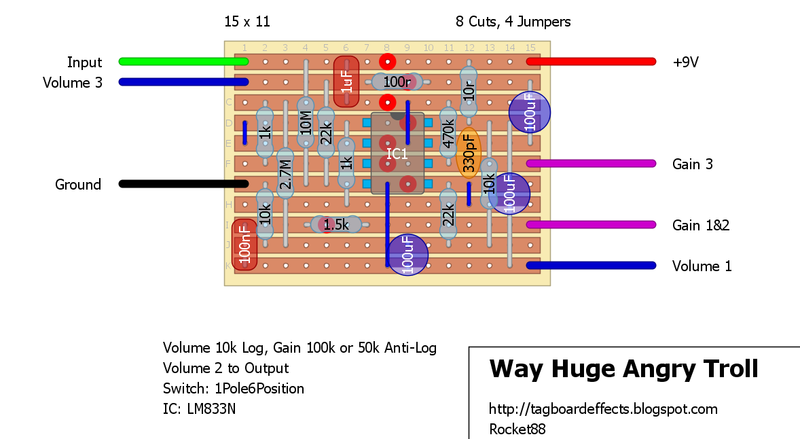 Really to make the pot have similar range to the switch, not only would there need to be the 1.5k resistor, but a 160k resistor across the pot lugs to bring it down to 61.5k. I could be wrong though. Miro is right, you would need a 1k5 resistor between the 100nF cap and the Gain1&2 connection to work as the original. That sets the minimum gain to about 310. As per the current layout there is no minimum resistance, so I think the maximum gain would be theoretically infinite causing oscillation at the maximum setting of the gain pot. 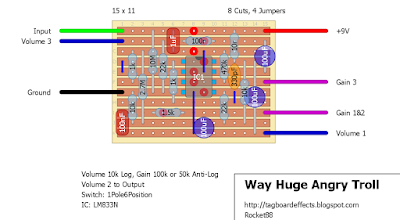 Putting a 160k resistor across the lugs would not only change the value of the pot but also would alter the taper, making it behave more like a linear pot. In this case that wouldn't be good as the big changes in the gain would shift towards the end of the turn of the pot. I'd rather suggest either a C100k or a C50k. With the former one would get less gain at the minimum setting and to have the whole range shifted a bit to the clockwise direction of the turn of the pot, and with the latter the distribution of the gain settings would be more even across the whole turn, but the minimum gain would be more than in the one with the gain switch. I personally would probably go with the C50k pot. As Csaba said, without the 1K5, we'll run into oscillation issues unless the feedback loops small cap is upped considerably - this'll result in unwanted loss of high frequencies. The C100K will only add more of the lower gain settings and due to C taper, the sweep would still work very well, without notable unusable area. Dist+/OD250 has a C500K pot in similar setup and that works quite well for the whole turn. A trimmer of 5K value to set the maximum gain (in place of 1K5) would also be a quite nice thing to try. The C50K will work just as well. With only minor loss in lower settings. Nice circuit anyway. Basically a buffered Dist+/OD250 gain stage without clipping diodes. Lots to tweak in there. This, also means that there is a reason for 833. Those'll clip more gracefully than some others. Any dual should be tried to see which performs the best..
Ah. Did not even think that oscilatoin could be an issue. Simple change and I'll fix it when I get back from class. I wait the verify the second version with pot, Im going to buld that with a 4558, think it could work, also, I have 20 4558 an non 833, do that in a Crunch Box and work very well. Can't wait to try this one out! More Way Huge layouts please! don't worry. i've got a few waiting in the wings. Can we have the Way Huge Ring Worm PLEASE! Version with the anger pot works great. Thanks Zach. Also would increasing the input cap add in a little more low end? I find it a little too trebly with more anger dialed in Sorry, deleted my previous comment to subscribe. Nope. The 1u is not cutting your lows. Up the 100n for 220n. That'll take the high pass filter rolloff frequency created by gain amp way lower. Thanks Miro. I put a 100nf and 330nf caps on the outside lugs of a three position DPDT switch with a 100nf in the center and it worked great. I'm using it to push an Orange OR15 and it became very trebly with more anger. It was very harsh with my Vox AC10 too. I haven't tried it through the Vox yet but I built it more with the OR15 in mind.